Each year, my friends Mark Spina, June Fisher and I plan a cross country trip. The purpose of the trip is to get to spend some time with my God daughters, Katie and Jackie Fisher. Oh yeah, did I mention I get to bird everywhere we go. This years destination was Yellowstone National Park. Though I have been to the park twice many years ago, I still had a few lifers that I could get. We start out by going on line to find a home or cabin to rent for a week or two. 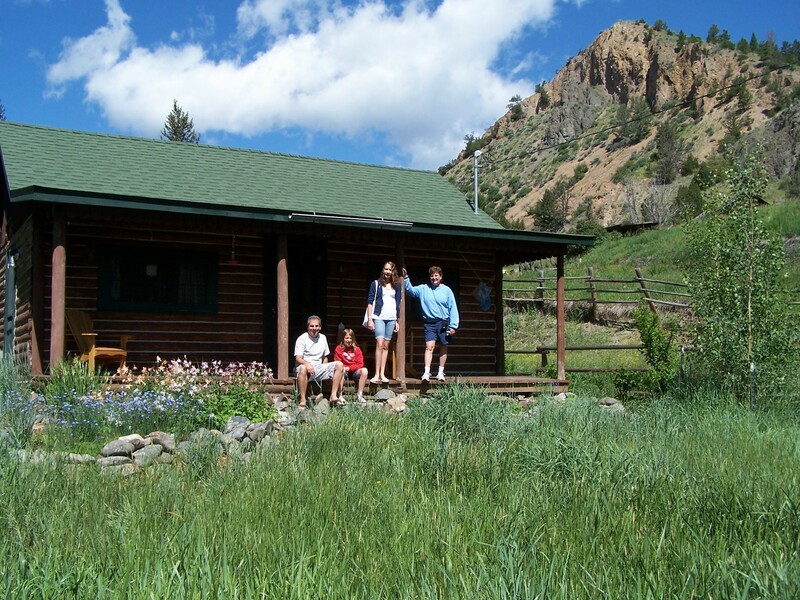 This year, we rented a cabin in Gatlin National Forest along the Cinnabar Creek just outside of Gardner Montana. It slept five comfortably. There was no TV and we played cards and games every evening that we were home from wildlife watching early enough. The Trip. Mark and I headed out across country the morning of the fourth of July. 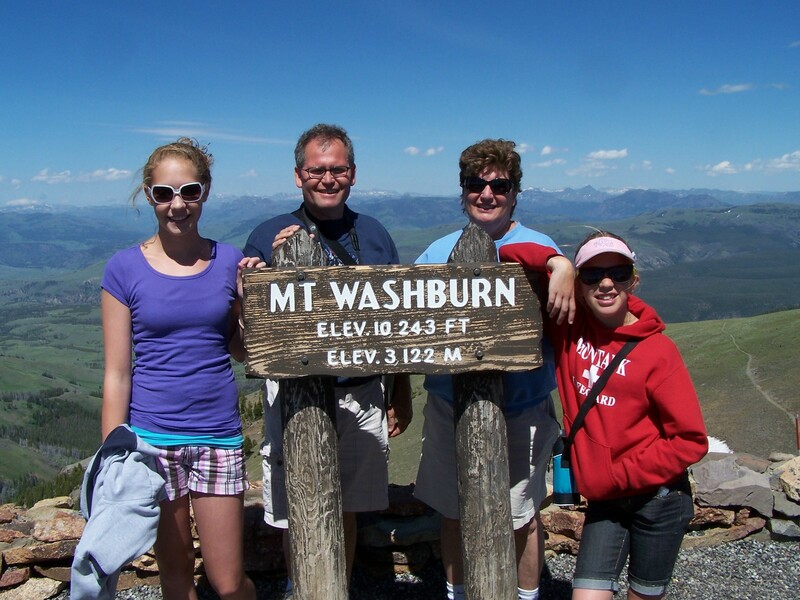 June and the girls were already in Las Vegas, Nevada for a family reunion and would be meeting us in Wyoming. Leaving at five am, we amazingly made Winona, Minnesota the first night by 10 pm. This is just across the Mississippi from LaCrosse, Wisconsin. That meant that the second morning we would start to see western species. Minnesota did not fail us, and we had the first birds early that day. American White Pelicans seemed to show up everywhere. We continued on through South Dakota. The prairie pot holes, as the many lakes and ponds are called, were very productive. Eared Grebe, Great Egrets, Double-crested Cormorant and many ducks were seen. Western Kingbirds began to outnumber their Eastern cousins. Upland Sandpipers were perched on every other fence post in certain areas along rt. 90. We reached Wyoming, staying the night in Gillette, and the next day the real fun began. The scenery is just spectacular. Lark Bunting were seen all along this route. We first headed into the Bighorn Basin. I had hoped to get my ABA Chukar here, but as the birding guide to Wyoming had stated, this common bird simply seems to disappear from June to August. From there we went on to the Bighorn Mountains. We found nice birds like Broad-tailed Hummingbird, Cooper’s Hawk and Green-tailed Towhee. From there we headed through Cody and up the Chief Joseph Scenic Highway. An extensive wetland held many species of birds. American Wigeon, Northern Pintail, Redhead, Ring-necked Duck were among the ducks as well as Wilson’s Phalarope and Great Blue Heron. Horned Lark, Western Meadowlark, Yellow-headed Blackbird and Brewer’s Blackbird were all seen. Our only Golden Eagle and two Sage Thrashers of the trip were also seen here. We continued on to the Beartooth range and the Beartooth Plateau. My target bird here was the BLACK ROSY-FINCH!! After a couple of hours of winding around mountain crags with no luck, I finally found a Rosey-finch right at the Beartooth Pass. The bird was kind enough to remain near the road with American Pipits and Horned Larks flying all around. I got several decent pictures of the Rosy-finch. From there we headed to Cooke City Montana where we would enter the Northeastern gate to Yellowstone National Park. Construction on the road in Cooke City delayed us and as we waited, I scanned the ridges to the south of town. Our first Mountain Goat of the trip was perched high above town on seemingly inhospitable cliffs. White-throated Swifts were present near all the cliffs and were frequently accompanied by Violet-green Swallows. As we passed a small fast flowing creek, I spotted an American Dipper. We continued into the park through the Lamar Valley. Wildlife was everywhere. Pronghorn Antelope, Bison, Elk and Coyotes were seen along the way. Ponds here held the first of many Barrow’s Goldeneye that would be seen on the trip. 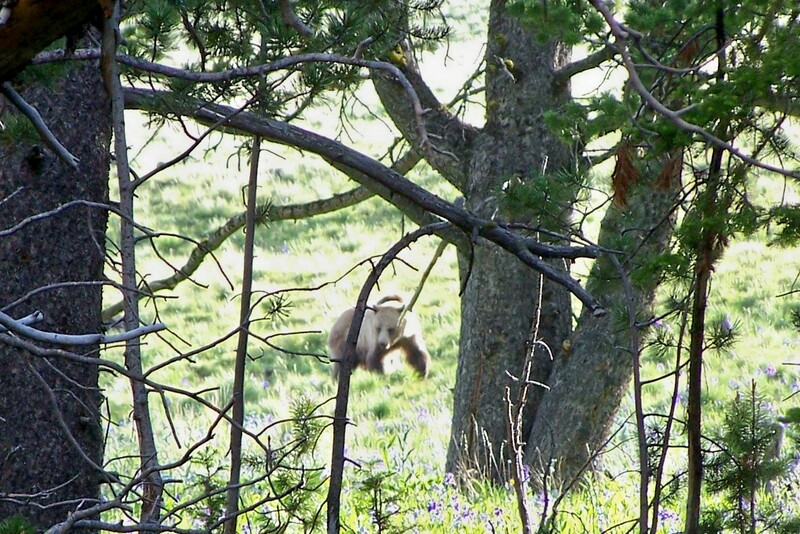 As we proceeded, we ran into one of what would be many “Bear Jams” on our trip. We missed this bear, only to spot another just a short distance up the road. Our first Black Bear of the trip. Our arrival at the cabin was late due to our many stops, but it was a great first day in Wyoming. 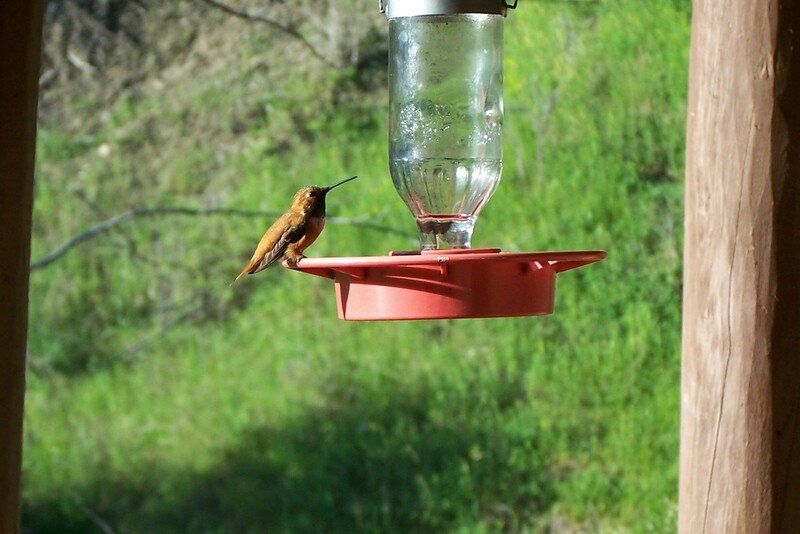 I had brought my own hummingbird feeder which attracted several hummers within minutes of hanging it up. Rufous and Broad-tailed Hummingbirds and what I was sure was a female Calliope. The next morning, June 7th, Mark and I started to explore the park. We took the road from Mammoth Hot Springs to Tower Junction then south through Hayden Valley to Yellowstone Lake. We birded and saw the sights as we made our way south. Ducks were present at all the ponds and rivers. Ruddy Duck and Barrow’s Goldeneye were most common followed closely by Lesser Scaup and Common Merganser. Black-billed Magpie, Clark’s Nutcracker and Common Raven were all very common. We then headed further south, through Grand Teton National Park. The sights were breathtaking! We had to pick up June and the girls at Jackson Hole Airport as they were flying in from Las Vegas. We picked them up a little late due to construction on the roads. We had checked the park site to avoid construction delays in Yellowstone, however I had forgotten to check out the Grand Teton site and there were several construction delays there. I would advise anyone going to check out these sites in advance of your trip. We then headed back toward Gardner, seeing many birds and animals as we went. The highlight for me that afternoon was coming across a yearling Grizzly Bear just before reaching Mammoth again! The morning of the 8th we decided to retrace some of our steps and really see some of the sites. We visited the Upper Falls and Lower Falls of the Grand Canyon of Yellowstone. We drove around Mt. Washburn and checked out Canyon Village. The most exciting surprise of the day was when two Wolves ran out in front of our car. I screeched to a halt! We had momentary great looks at these two beautiful creatures, one black and one gray, before they ran off into dense woods. We were later told by many of the wolf experts who watch for the wolves daily in the park that we were very lucky as most people only see these animals from a great distance through a scope or binoculars. In fact, the only additional wolf we saw on the trip was one coming down a slope far in the distance through my spotting scope. Some of the new birds for the day included Dusky Flycatcher, Cordilleran Flycatcher and Mountain Chickadee. The morning of the 9th we decided to head down to Old Faithful. This was a great area to explore. We visited many geysers and thermal pools, as well as boiling mud pots. Passing through a great deal of sage brush country we had many sparrows. Vesper was absolutely everywhere, followed closely by Brewer’s Sparrow and Savannah Sparrow. We also had our first Osprey and Sandhill Cranes of the trip here. The 10th of July we had a planned hike up Mt. Washburn. I got up early however and went up past Mammoth to bird. I birded that area as well as the willow flats just south of town. I had many great birds, including an American Wigeon with eight ducklings, Northern Pintail, Wilson’s Warbler, Common Yellowthroat and the only Yellow Warbler of the trip. I then returned to pick everyone up for the hike. It was a hike of three miles up the slope with an elevation gain of 1400 feet reaching a height of 10,223ft. This was not the birdiest spot, but the views were spectacular as were the Wildflowers and Butterflies. 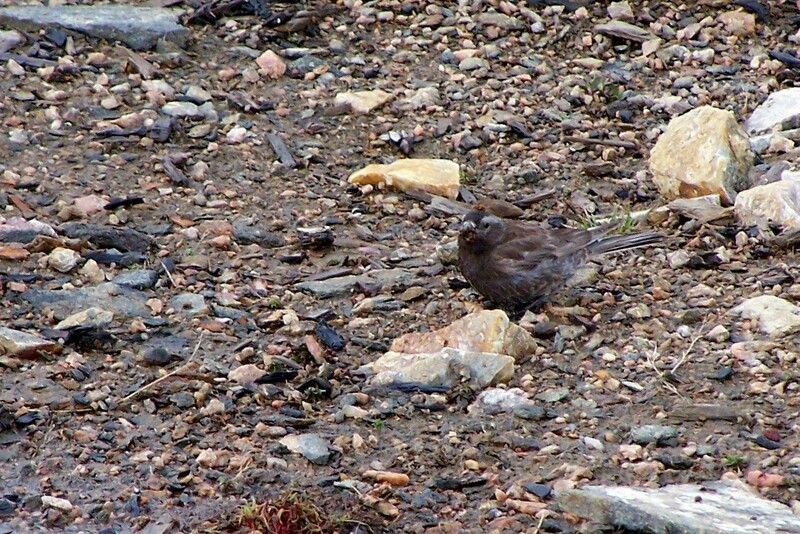 Species seen included Pink-sided Junco, Lazuli Bunting, Mountain Bluebird and Clark’s Nutcracker. Three quarters of the way to the top we met up with a band of 14 Bighorn sheep, ewes with their lambs. As we neared the summit, we had several Yellow-bellied Marmot and a few Pica at the top. From the top I think we could see at least 100 miles in all directions. Upon coming down, we searched for wildlife along the way back to Gardner. We first found a large honey-colored Grizzly Bear in a meadow on the lower slope of Mt. Washburn. Later we found a dark phase Grizzly near the Petrified Tree on the Blacktail Plateau. In a small pond, also near the Blacktail Plateau we found a cow moose resting. 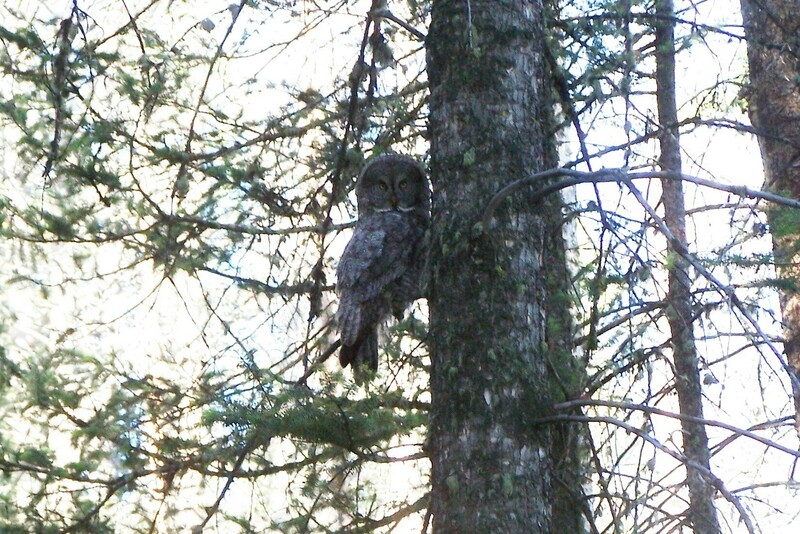 June asked me if I was going to go out again to try for Great Gray Owls. I had tried one evening in the best location to no avail. I also kept a keen eye in a number of other locations they had been seen, but my lack of luck with this species continued. I have missed this bird on a couple of other trips and missed it in New York by being away the last time one was there. I told her that it just wasn’t meant to be and I was spending the evening with them. We stayed home and played spades and Spoons and laughed our butts off the entire evening. The 11th was a late start day. We were all getting pretty tired. Hiking and wildlife watching right up to dark each day and playing cards and games till near midnight each night. I sat on the porch most of the morning enjoying a dozen or more hummingbirds coming to my feeder. Calliope Hummingbirds now numbered at least three with a beautiful male coming regularly. I think this is now my favorite hummingbird. Five or six Rufous Hummingbirds and a number of Broad-tailed rounded out the group and were all great to watch. The resident Lazuli Bunting that often sat right on the corner of our cabin singing was a nice addition to the show. Western Tanagers bathing in the creek by the cabin wasn’t bad either. We finally headed out around noon. The girls wanted to swim in the Gardner River where the Boiling River flows into it. The Boiling River is a river that emerges from a cave like opening in the ground and has a temperature of over 180 degrees. The water quickly mixes with the 40 degree water of the Gardner River and is quite a neat experience to swim in. We then headed back to the cabin for a glass of wine and a great home-cooked meal. The morning of the 12th I managed an early rise and headed out to the Blacktail Plateau to bird. This is a fabulous spot and the birds in the morning are abundant and easy to see. Later, in the heat of the day, you would think there aren’t any birds there. I traveled along this six mile one way dirt road, stopping frequently to spish. It was here that I had my first Williamson’s Sapsuckers of the trip and had at least six before the morning ended. Brewer’s and Vesper Sparrows were everywhere. 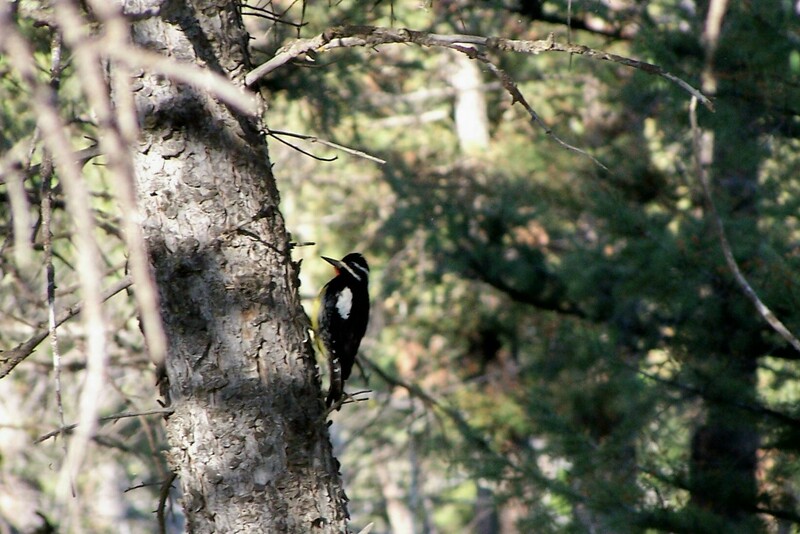 I was seeing many of the usual birds along the way when I approached a curve and noticed a neat patch of woods. I decided that despite the fact I was only a short distance from the spot we viewed a Grizzly Bear the evening before, I was going to bird these woods (with a very wary approach). I entered the woods and began to spish. Birds descended upon me from everywhere. Gray Jays, Western Tanagers, Western Wood Pewee, Pink-sided Dark-eyed Junco, Red-shafted Northern Flicker, Mountain Chickadee, Swainson’s Thrush etc. I was in my Glory. The jays came right up to me. I decided I wanted a photo, but realized my camera was not around my neck. I quickly headed back to the car so I could get it and get some closeups of the jays. When I returned, the jays had moved off. I started spishing again and followed them up the hill a little. They would not cooperate. I couldn’t even get close to them. I continued to follow, spishing as I went. Birds just kept coming in. I suddenly realized something large had flown into the tree just to my left. I couldn’t see it, but from the glimpse I had when it landed, I knew it was big. I hesitantly moved around the trees blocking my view and was astounded to be face to face only twenty feet apart from a GREAT GRAY OWL!!! As we were so close, the bird flew back about fifteen feet, just out of view, but still very close. I decided to go out of the woods just beyond it and walk back. The bird sat in a tree just about thirty feet from me as if I wasn’t even there. I quickly snapped a few shots and then tried to get a little closer. The bird had had enough and flew across a small opening to disappear into the deeper woods. I decided not to pursue him further, but rather enjoy the thrill of such an unexpected find and the great photos I did get. I continued to bird the plateau, but there would not be another bird to match that owl. I headed back to the cabin, picked everyone up and we headed out to Lamar Valley for more wildlife viewing. We first headed up to the cliffs where Mark and I had seen Mountain Goats a week earlier. We were not disappointed. We found a nice Billy on the slopes and then a Nanny with twin kids! From there we went to Trout Lake where we had heard River Otters were feasting on the spawning trout. Again success! A mother otter was catching trout for each of her three offspring. What a show! When we could finally pull ourselves away, we headed back into the valley. On the way back to Mammoth, we saw three Black Bears! Each a large male foraging for food. Interestingly to me they seemed to all be feasting on the seeding heads of the grasses in the fields. They would grab a mouth full of grass and sweep sideways, removing the abundant seeding heads. I have never witnessed that in our local black bears. The morning of the 13th found us leaving the cabin and heading for home. The trip was not over yet though. We were going to visit the site of the Battle of the Little Bighorn where Lieutenant Colonel George Armstrong Custer met his demise against the American Indian tribes of the west. A headstone marks the spot where his body was found. His body was later transferred for interment at West Point, where we have seen his grave in the past. At the battlefield, I found abundant Western Kingbirds, surprisingly to me, many Eurasian Collared Doves and my only Orioles of the trip, a first year Orchard Oriole and an adult Bullock’s Oriole. From here we continued eastward and entered North Dakota. At a spot along rt 85, south of rt 94 I stopped to try for Baird’s Sparrow. This is another bird I had missed in the past. I had spoken to a man in North Dakota who informed me that with the route I was taking this was the most reliable and close spot to try for them. When I stepped out of the car, I could hear Baird’s Sparrows. I tried in vain to see them, but they remained hidden in the grass. If that wasn’t bad enough, a strong wind had started to blow and it was only about fifty degrees. I tried for a while and used my caller, but none popped up. June suggested we try a spot just down the road, as we hadn’t been at the exact location, but rather stopped at a safe pullout. As I pulled away, she said John I just saw a small sparrow type bird fly up onto the sign at the side of the road. Maybe you should go back. I returned quickly to find a singing BAIRD’S SPARROW on the sign. He gave us great views and returned several times after flying down into the grass! We then departed for the long ride home, happy with the results of another fabulous trip west!